On New Year’s Day, it’s safe to assume most people are nursing a hang over or cleaning up from the night before. But there is another tradition on this fresh-start day other than keeping the party going—one that takes a lot more stamina than bottomless brunch and requires more than just a “new year, new me” Instagram post. On sandy and rocky shores all over the world, brave souls dive into the freezing sea to start anew and quite literally wash the slate clean. The Dutch refer to it as Scheveningen and don bright orange hats, some call it an ice dive, but in America, it is most commonly known as the Polar Bear Plunge. 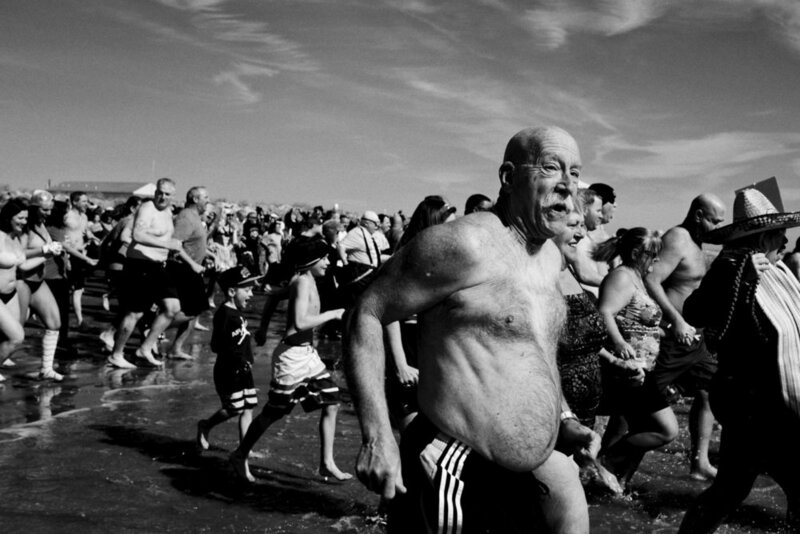 Hundreds of people take to the Atlantic ocean and Great Lakes to partake in the plunge. Facing arctic temperatures, these brave souls do it in the name of charity and tradition. This event has become so popular that in some parts of US, specifically the Jersey Shore, they are held multiple times throughout the winter months. For example, The Polar Bear Plunge on the mile long beaches of Wildwood, NJ benefits the Special Olympics and has some of the highest turnouts of any plunge. “Our team has members from all over the country, including Colorado, Michigan, Florida, and South Carolina who come back to our home state to support our SONJ athletes and programs. I only do polar plunges for Special Olympics, otherwise you wouldn’t catch me in the cold water. This is my 13th plunge in Wildwood and it is my favorite weekend of the year,” said Carol Cowry, seasoned plunger and captain of the AlohAvengers, the top fundraising team of the year. In the months leading up to the big event, different “teams” filled with Special Olympics athletes, volunteers, daredevils, and thrill seekers will raise donations from friends and family. It’s a competition, but an amiable one. “Everyone is celebrating the finale of months of competitive fundraising. Every team does this for our Athletes, so, no matter who raises the most money, the Athletes are always the winners,” Carol added. You’re likely to see people dressed in crazy outfits. If it was October, and they weren’t on the beach headed for the ocean screaming at the top of their lungs, you might think everyone is dressed for Halloween. But they’re not—they’re dressed for the plunge and costumes are just part of the fun of it all. “The costumes kind of create a sense of camaraderie,” said Sean Wallach, veteran plunger. It’s pretty ridiculous to jump into the ocean in the middle of winter, so why not dress the part? The crowd and costumes help keep the plungers riled up and their adrenaline pumping. “We feed off the energy of the other teams on plunge morning, because it’s such a festive and rowdy crowd, we’re ready to jump in the ocean even in the frigid weather for a good cause,” said Carol. Besides the good cause aspect and the whole fun part, it’s frequently debated if there are any health benefits to taking the plunge. Athletes take ice baths, after all. The Spartans bathed only in frigid water because they believed warm water would weaken warriors, Swedes have sworn by the tradition of ice-hole swimming. The Russians have a whole ice bath festival and you can hardly scroll Instagram without a gratuitous cryotherapy post. “If there are health benefits, I’m not sure I can stay in there long enough for them to work. There are some tricks to it, though. Running in as fast as you can. Jumping around. It’s important to keep moving to keep your blood flowing,” said Sean. This activity of diving into a freezing cold body of water tends to build a bond among the plungers, a sort of “we’re all in this together” mentality is formed. Nothing creates friendships quite like self-inflicted, near death temperatures. And the tradition doesn’t discriminate, you’re likely to see people from all different generations jumping in. “Our team and our hashtag is #alwaysrecruiting because we are always trying to introduce new people to the movement. Jumping into the cold Atlantic ocean during the winter is a great way to introduce fun-loving friends to the inclusion revolution in a way they’ll never forget,” said Carol. To the outsider looking in, it might seem pretty odd, maybe even a bit insane, to want to partake in the Polar Bear Plunge, but at the end of the day it’s all about a community coming together, far and wide, for a worthwhile cause. “We love it when we see members from Piggy Park pulling into the parking lot with their ginormous Polar Bear statue, and all the plunge teams with great costumes, friends cheering us on from the shore, and law enforcement groups who bring hot tubs and towels for when we all come sprinting back,” added Carol. In a time of division, it’s pretty heartwarming to see an event like this, one that is so pure and inclusive. Even if it is freezing cold.